"I never pretended to be a hero." FULL APPEARANCE: Estelle is a woman of average height, with the vaguely muscled build common to female riders. Her hair is simply brown, her skin on the paler side and her eyes an unexceptional blue. She has a round face with pronounced cheekbones and a mouth usually quirked in a faint smile. She rarely wears skirts, favoring trousers and riding leathers, and has a preference for the color red. Loyalty is both Estelle's strength and her greatest weakness. When she gives herself, she offers her allegiance to the point of blindness, idolizing her friends, family and leaders and following where they lead without questioning whether it's right. She's highly vulnerable to manipulation and sad stories and will go to great lengths to help someone she believes to have been wronged. She's not a woman of lofty principles. She is simply someone who cares and never stops to see the bigger picture. She's outgrown most of the bitterness and resentment of her youth and is now embarrassed to think of any of the times she hurt others and there are few hard edges left to her. She wants very much to be a good rider and friend and daughter and sister and maybe someday lover. Her actions, however, can go too far as she forgets that people have to live their own lives and fight their own battles and that intruding on other people's private struggles can be more grating than comforting and that good intentions aren't always the same as doing what's best. Mostly, Estelle just wants to belong and be loved and accepted and see all her loved ones settled and happy in return. She doesn't dream of heroism and leadership- simply as peaceful and happy a life as a rider can aspire to. She loves Jaehaeryth and indulges his quirks. Some might call it enablement, but she calls it doing what's needed for her dragon to be as happy as he can possibly be, without making him change who he is. HISTORY: Estelle was born at Igen Weyr to an old weyr family. It was a not untypical pairing, a male bronzerider and his greenrider weyrmate, who had four children together. Estelle and her siblings spent most of their childhood in the creche but always knew who their family was and always felt they belonged. Estelle was the baby of the family, loved and pampered, and she idolized her older siblings, especially her oldest brother, Elton. All four of them entered candidacy one by one as they came of age. Elleon and Tonelle also apprenticed as crafters, but Elton and Estelle didn't. They were from a family with a long history of producing riders, after all, and had little doubt they would Impress in due time. Even as Elton grew older and approached the end of candidacy, Estelle always believed his dragon would come. He was such a good brother and would make simply the best rider. How could he never get that chance? He didn't. Instead, in what would turn out to be his final clutch, Estelle Impressed to brown Jaehaeryth and Elton was left standing. His favorite egg, whose dragon he had dreamed of Impressing, instead chose a girl who shouldn't even have been there. A'lin. Estelle hated them all, her classmates who had stolen her brother's future. She even hated herself a bit and knew her dragon should have been Elton's. It was easier to lash out and focus on Molly, the interloper. She entered weyrlinghood filled with bitterness and teenage angst, flinging cutting words at Molly and spreading any horrible rumors that came to her. When the weyrlingmaster argued she should not be allowed to stay, Estelle loudly and vehemently agreed. She began to steady out only because Elton reminded her, as many times as needed, that it was nobody's fault, simply the way it had been. And because she was distracted by the needs of her own Jaehaeryth, who really was a wonderful dragon and who she loved, even if part of her always believed it should have been Elton who was chosen. Molly left soon after they graduated, whether driven away by their rejection or something else, Estelle didn't know. In the turns to come, as she saw more candidates age out and gained the perspective of maturity, she deeply regretted the way she had treated her. So she wrote to her and offered her an apology- a real one, full and genuine and without excuses. The two struck up a correspondence and strangely enough, Estelle came to consider Molly a friend. And then the tone of her letters changed. She'd been on a mission of some sort, to rescue a kidnapped goldrider or something like that, and it was obvious it haunted her. That things weren't okay. And so Estelle arranged a transfer. She would be there for her friend and make up for old sins. I will have you know, Estelle, this is a tremendous disruption to my schedule! FULL APPEARANCE: In size and build, Jaehaeryth is utterly ordinary. He's a midsize brown, nearly particularly bulky nor lean, with his proportions neither perfect enough to draw admiration nor odd enough to provoke any particularly comment. He simply is. Or rather, simply would be were it not for the color of his hide. Because his coloration? Is very, very flashy indeed. 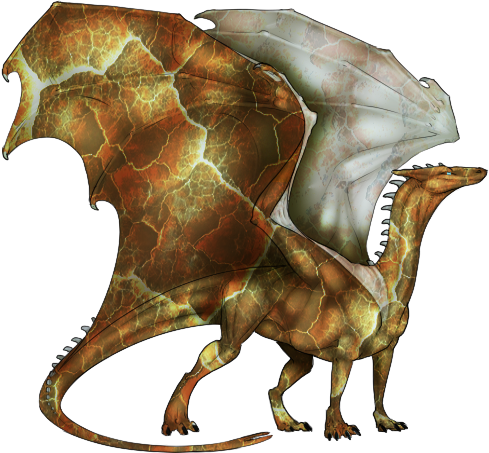 Jaehaeryth's hide is a riot of colors, deep reddish and greenish browns sliced through with yellowish markings so bright, he almost seems to glow from within. The striking, unmistakable pattern is broken only by the color of his wings, which are faded and pale by contrast, but with the same amorphous design faintly spread across them. 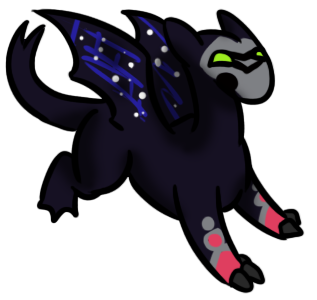 Jaehaeryth is a dragon who prefers to wake at the same time every day, take the same route to practice each morning and comment on the same constellation each night. He is a very meticulous dragon who is knocked off balance by anything that smacks of disorder or chaos and will fret to no end about the slightest deviance from his schedule and usual habits. While he does have people he loves, especially his rider, he is not particularly demonstrative and is easily embarrassed by overt declarations of fondness or friendship. He does not enjoy being the object of attention and would rather like to go through his day in the comfort of anonymity and familiarity. Jaehaeryth when panicky doesn't squeak or protest- he gets cold and formal, trying to hide his anxiety behind an illusion of stoicism. Or if that fails, as it often does, grumpiness. He does not ENJOY being interrupted from his regularly scheduled mid-evening nap or having his perfectly planned walk around the weyrbowl disturbed by some weyrling prank. If he must occasionally have some draconic company, which he supposes he musts, he can't see why they can't just discuss philosophy or watch the sunset or walk along the fireheights, something sedate and peaceful and non-disruptive.